Whether you’re looking to start a new fitness program or get back on track, these 4 tips will help you stop missing workouts and more consistently move your body! I’m so excited to have a special guest sharing some great exercise info with you all today. Katherine and I met through the amazing world of social media and we connected over our passion to help busy women, especially moms, live a consistently healthy life. I know one place I am really slacking is in the fitness department, which is where Katherine excels. I am so thankful for her great tips below and hope they help you start an exercise program or stop missing workouts and get back on track! Take it away Katherine! Hi friends! I am SO excited to be here! I blog and coach over at at KatherineEdgecumbe.com and am stoked to share some of my love for convenient, efficient movement over here as a guest blogger at Small Bites by Jessica. I’m a personal trainer and nutrition coach who specializes in helping women change their bodies and get consistent without any stress, obsession, or restriction. We’ve all got enough going on, don’t we? Stressing constantly about food or exercise is just not worth it. And frankly, it isn’t needed when it comes to getting consistent with our workouts. But the truth is, many of us still struggle with fitting in our workouts. Staying consistent with a fitness regimen is really tough, especially when there are a hundred distractions vying for our attention. Between getting the kids to school, tidying up the house, grocery shopping, and prepping for dinner – not to mention going to work – our workouts become the easiest thing to skip. And this makes sense, doesn’t it? You’re busy, and often, working out is just another chore that you don’t wanna do. As a personal trainer and nutrition coach, I work with busy women to help them change their bodies & get consistent without stress, obsession, or restriction. Central to this is incorporating short, effective workouts into the busiest schedule. 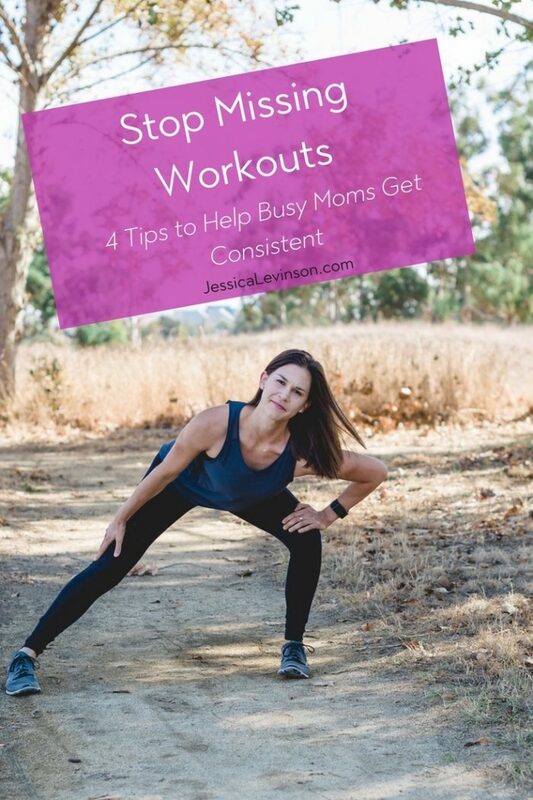 Today, I’m sharing my top 4 tips to help you stay consistent and stop missing workouts, regardless of how crazy your schedule gets. When consistency becomes an issue, self-discipline or willpower will never be our solution. Too often, we try relying on self-discipline, which sets us up to fail. Instead, I’m a huge proponent of doing all things nutrition and fitness without any willpower and with a lot of planning. It sounds so simple but it’s true. We don’t just skip doctor appointments because we’re tired. We don’t no-show dinner with friends because we’re stressed about the kids’ homework (well most of the time). But we do this with our workouts all the time. Instead, we need to plan everything. Just like Jessica recommends meal planning to ensure healthy meals are on the table throughout the week, so too you need to plan your workouts. Each Sunday, take ten minutes to look over your schedule for the upcoming week and insert your workouts into particular dates and times. I love doing this with my clients, because we are able to review upcoming workouts and make sure that they will have enough time (and energy!) to complete them. Have to take the kids to the pediatrician on Tuesday? Probably not the best day to do a long lifting session. Schedule a quick 20 minute bodyweight workout (like this one) instead. On your own with the kids on Saturday? Schedule a long walk with the stroller and have older kids ride their bikes alongside you. This is a great way to incorporate more movement into your day, get the kiddos outside, and role model the importance of exercise. So many of us believe that in order for a workout to count it has to be 60 minutes. For years, I believed that I had to exercise for an hour in order for it to count. If I couldn’t get in a 60 minute sweat sesh, I’d skip my workout. I remember waking up late for class in college and realizing I didn’t have enough time for my crazy long workout session. Instead of throwing on my shoes and doing a quick bodyweight circuit in my dorm, I huffed off to class, feeling like a failure. And that’s so common, isn’t it? We get down on ourselves and feel guilty when we can’t fit in that hour long workout, regardless of the circumstances. Before implementing shorter workouts, I’d feel overwhelmed by the amount of time it would take to complete a workout. On days when I didn’t have at least an hour to devote to working out, I’d just skip it and make myself eat less to “make up for” my missed workout. Now, I’ve cut my workout time in half (here’s why) without compromising results. So, instead of focusing on duration, it’s time to focus on intensity. Whether you’re outside running sprints, doing bodyweight metabolic conditioning, or modifying a strength session to be more metabolic, make every workout intense (for you) and super fast. Try out this free #SkipTheGym workout to see how you can get an awesome workout done in less than 35 minutes! While scheduling your workouts helps, we need to take it one step further and really prepare for each workout session. Are you heading to a class after dinner? Pack your gym bag with extra clothes, shoes, and a snack WELL before the day of your workout. Early bird workout (like me)? Lay out your workout clothes, fill your water bottle, and figure out your pre-workout snack the night before. In addition to setting your physical self up for success, I also encourage my clients to start ahead by mentally preparing for the workout. This gears your brain up for the work you’ll do AND even more clearly sets your intention to complete the workout. To put this into practice, ask yourself the following questions at least twelve hours before your workout. What exercises are included in my workout? Do I need any modifications? Progressions? What’s my goal for the workout? How much time will I need to complete the workout? It’s incredibly valuable to have someone hold you accountable for the workouts you need to complete. This can be a trainer (hi! ), a group of like-minded people, a workout buddy, or even social media. A sweaty selfie check in on Instagram can be a great way to keep you feeling motivated to smash out your workouts. With all of these steps, there’s no need to battle with your self-control anymore. You can nail all your workouts without using your willpower, especially if you tag me in your post workout pictures. I’d love to cheer you on! I hope these tips have been helpful and will enable you to be so much more consistent with your workouts! Catch me on Instagram and Facebook and let me know how it goes! Thanks so much to Katherine for sharing these awesome tips to stop missing workouts! I need them just as much as anyone, and I hope they help you as you try to fit in exercise for the rest of this year and the year to come. What is your best tip to stop missing workouts? I’m not a mom, so i can only imagine how much harder that makes things. For me it’s all about habits, if I get used to a routine then I’ll find a way to stick to it! Everyone is so busy these days – it’s on trend to be so, lol! So these tips will hopefully help everyone, not just moms. I agree routines really help. I was in a routine of going to spin class two to three times a week starting last december through June, but then I got out of habit when the kids were in camp and my schedule and routine changed. Time to get back to it. Wake up early! I sneak in a workout, shower and quiet time eating breakfast before my kids wake up. Preserves my mommy sanity! Good for you Laura! What time do you have to wake up to make that happen? So glad it’s encouraging and helpful Whitney! Good luck with everything you have going on and baby on the way!! These are wonderful tips! Thanks for sharing! You’re a fitness enthusiast – any tips to share? I admit that I’m guilty of feeling like I have to get a full hour in. I like the idea of breaking it up more. I’m the same way. But I feel like once you give yourself permission to break it up and do only 30 minutes it’s a lot more manageable. These are great tips! Very helpful as we are in such a busy time of the year! So glad they are helpful Taylor! I love this guest post! I struggle with consistency too, so I am loving all of these tips! I’m so glad you find this helpful Emily. Hope you are able to get into a routine in 2018! I really like the scheduling tip! This is something that’s really helped me stay on task when it comes to working out. If it’s on my schedule, then it feels like it’s something I can’t miss! Yes! I say the same thing for meal planning. So glad it works for you! So glad to hear that Deborah! I’m not a mom, but I generally have 60-80 hour work weeks, so I definitely understand being busy! I like to sneak in workouts and just moving around whenever possible! Wow! That’s definitely busy Farrah! These tips definitely apply to everyone who is busy, not just moms. Hope they help you and you keep on moving! I am definitely going to be using these tips once I become a mother soon! Hope they are helpful! Enjoy every minute of your own now!! So glad you enjoyed the post Mikki. Good luck kickstarting! You do you, and if that means you start Jan 1st and that works for you, then go get ’em! That’s awesome! I wish I could get up early, but i can barely make it out of bed to get the kids up for school! Something is definitely better than nothing! Good for you Christina! So glad they are inspiring you Agness. They inspired me too! Good luck!